Sweet almond oil, made from pressed almonds, is an odorless, pale-yellow liquid with a nutty taste. It's similar to olive oil in composition and can be used as a substitute. 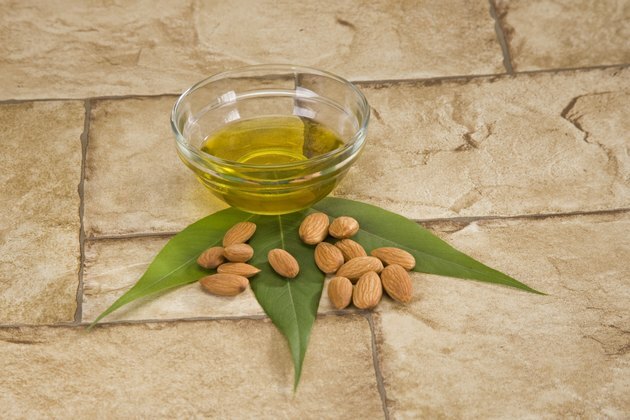 It's not, however, to be confused with bitter almond oil, which has a pungent flavor and is typically used as a flavoring agent. Sweet almond oil's culinary properties have been employed for centuries, as have its medicinal and therapeutic advantages. Whether you enjoy it on a crisp salad or use it as a skin-soothing agent, experience the benefits of sweet almond oil. Sweet almond oil contains high concentrations of monounsaturated fatty acids, or MUFAs. These unsaturated fats are linked to cardiovascular disease prevention. An article published in "The Journal of Nutrition" in April 2002 noted that studies done on MUFAs show that both whole almonds and almond oil effectively reduce harmful low-density lipoprotein cholesterol, LDL, and increase protective high-density lipoprotein cholesterol, or HDL, which may reduce cardiovascular risk. Vitamin E helps your body make red blood cells and properly use vitamin K. It's also a potent antioxidant. Antioxidants are powerful substances that help protect your body from free radicals, which are unstable molecules that can damage healthy cells. Antioxidants are linked to a reduction in chronic diseases such as cancer and heart disease. Almond oil is rich in vitamin E. A 3.5-ounce portion of sweet almond oil provides approximately 43 international units of vitamin E, which is more than 100 percent of the daily value set by the U.S. Food and Drug Administration based on a 2,000-calorie-a-day diet. Vitamin K is a fat-soluble vitamin, which your body stores in fat tissues and your liver. It helps regulate proper blood flow and is crucial to effective blood clotting. Vitamin K also plays an important role in bone health. A 3.5-ounce portion of sweet almond oil provides 7 micrograms of vitamin K, which is just under 10 percent of the DV set by the FDA. Sweet almond oil, when topically applied, may help protect your skin from the sun's damaging rays. The effect of these rays -- known as ultraviolet, or UV, radiation -- is linked to increased skin aging and various types of skin cancer. A study on the effects of almond oil on skin's exposure to UV radiation, published in the "Journal of Cosmetic Dermatology" in March 2007, concluded that topical almond oil can slow the aging process and prevent structural damage caused by UV rays. Can Almond Oil Benefit the Face?